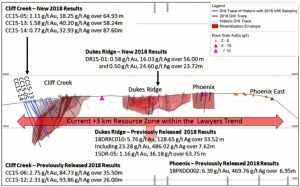 BRITISH COLUMBIA – Benchmark Metals of Edmonton, Alta., has been infill drilling historical holes at the Lawyers Trend in the Toodoggone mineral district on the eastern part of the Stikine Terrane. The company is particularly interested in verifying unpublished historic drill holes. Drill hole CC15-13 assayed 1.58 g/t gold and 40.20 g/t silver across 58.2 metres with sampling ending in mineralization. Hole CC15-14 assayed 0.77 g/t gold and 32.93g/t silver across 87.6 metres. Hole CC15-05 assayed 1.1 g/t gold and 18.25 g/t silver over 64.9 metres. The Cliff Creek and Dukes Ridge zones are a network of quartz veinlets and localized hydrothermal quartz breccias hosted in silicified and potassically altered andesite rocks. There appears to be continuous near surface bulk tonnage mineralization.